With the Natural Trust publishing an article entitled “Save children’s relationship with the Outdoors” recently, I immediately thought of one activity that can catalyze the process…. What better way to rekindle passion for the outdoors, than to venture and set up a slackline? You protect the trees you choose, get to enjoy a tranquil setting, all whilst getting healthy exercise! Perfect! Slacklining is fun and playful and teaches you a lot about the natural environment, especially trees. With more children able to recite logos and brand names than tree types and leaf varieties, don’t you think it’s time you took them out to slackline instead? You can follow the progress of this Natural Trust campaign via the Outdoor Nation twitter feeds. Harry Cloudfoot is a slackline instructor based in London, UK. He teaches all ages and all levels. Contact Harry here. This entry was posted in Events, Slacklining and tagged Fiona Reynolds, harry cloudfoot, london, maverick slacklines, natural trust, outdoor nation, private lesson, slackline classes london, slacklining, slacklining workshops, tree protection by harrycloudfoot. Bookmark the permalink. I had the same thoughts when I read the NT report. I am surprised that it is taking so long for the benefits of slacklining to be recognised (for kids of all ages! ), but then I suppose it’s in competition with all the digital ways children these days can spend their time. I think a lot of slacklining’s benefits come from the meditative amount of focus required to achieve balance to stand on the line, and there are not many things kids can get into these days that require such prolonged focus and attention. Also the gratification is not instant but requires persistence and hard work. In much the same way learning a martial art (for example) increases confidence, ability to maintain concentration and greater self esteem as well as all the physical benefits, slacklining also offers a nicely integrated way to enhance the physical and emotional development of kids in a digital age where these things are increasingly neglected in favour of easier, more insular, cyber activities which lead to a lack of outdoor play and a general erosion of kids knowledge of or time spent with nature. It’s also cheap, once you have invested in a line, and a social activity families can share together. And as you said a perfect way for kids to learn about trees, and that’s something easy to branch out from (pardon the pun) into ecology, carbon/water cycle, transpiration etc etc. Wow! Great points there Maddy, thanks for commenting on the post. You’ve summed up slacklining so well! I agree with you – slacklining is still very young / unnoticed in the eyes of mainstream…perhaps this summer it will gain more exposure with the work I and Maverick Slacklines are doing. And with you and other slackline club members talking about it like this in a positive light is just fantastic, too! Now I know that, really, slacklining doesn’t need any more appeal. We both know that all the kids that try it, love it. 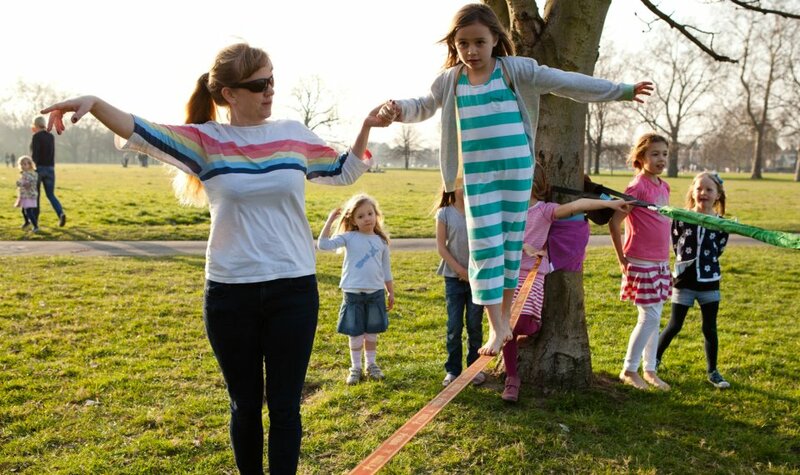 But kids have parents, and I suppose it’s more how do we get the message out to the parents that slacklining is something they should take their kids to try out? I really like what you mentioned about the persistence / challenging side of slacklining, and the meditative side, too.